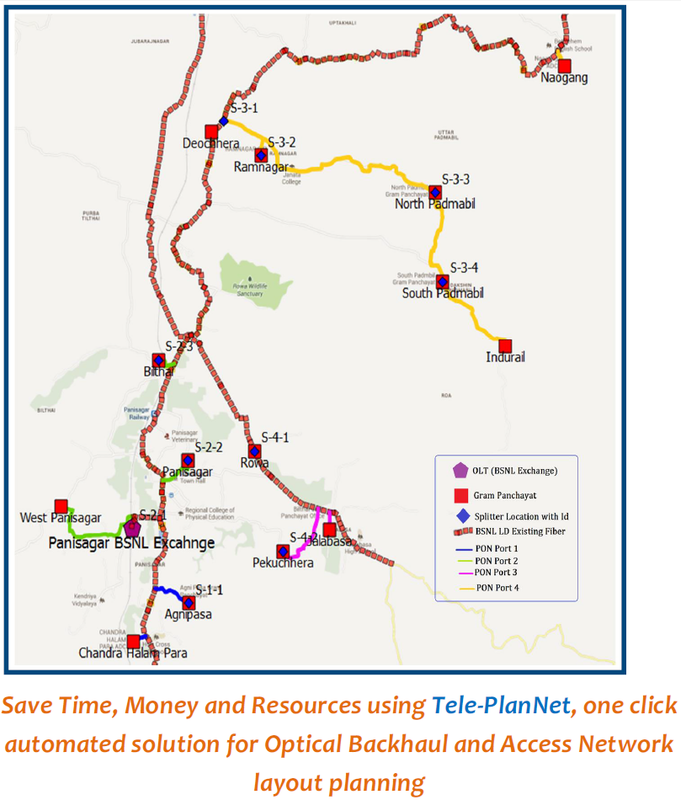 Tele-PlanNet is a one click automated Web based solution for Optical Backhaul and Access Network layout planning. Tele-PlanNet was developed to meet the requirement for setting up a new telecom infrastructure while utilizing as much of existing infrastructure as possible. It automates the entire process of visualization, plan generation and the preparation of construction documents. It suggests you the most cost effective plan for your network deployment with suitable technology selection and route optimization. Tele-PlanNet allows you to manage the telecom assets by visualizing them on satellite image. It’s a web Application which can be hosted in Any Data Centre/ Cloud and user can use its functionality through web browser. • Optical fibre layout planning for different Optical Technologies along with Electronic Equipment optimization and Optimized Fibber length calculation. • Verification of Manually Surveyed Routes. • Future Planning for Existing Network. • Inventory Management of the planned network. GPON network Planning for 1,50,000 Gram Panchayats of India, under the Bharat Net Phase-I (previously known as NOFN) to provide last mile connectivity from Central Office to Customer premise.